Beil, Michael D. Lantern Sam and the Blue Streak Bandits. Copy from Young Adult Books Central and reviewed there. Henry is traveling on the Lake Erie Shoreliner train in the 1930s from New York back home to Ashtabula, Ohio (the birthplace of Yours Truly, and pronounced ASH tuh BEW luh ) where his father is the captain of the Point Pelee, a freighter. He meets a rich heiress, Ellie, who is traveling to Conneaut (KAHN ee awt) to travel on the new roller coaster, the Blue Streak. She invites Henry to go with her family, but before long, she goes missing. 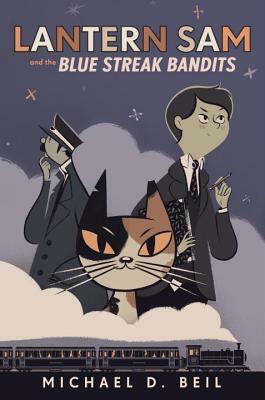 Lantern Sam, a cat who hangs out with Clarence the Conductor, is able to telepathically communicate with both Henry and Clarence, and helps with the investigation. There are all manner of suspicious types on board, and many of them are not all that they seem to be. In between these investigations are Sam's stories of his close calls and previous investigations, many of which involve his much beloved sardines. Ellie is found, but her mother's expensive necklace, also called the Blue Streak, was used in the ransom, and finding it leads to even more evil doers, some of whom are unveiled during the Blue Streak's inaugural day. Strengths: Beil always does a great mystery, and I love how he brings in details of Ohio places! This had a lot of nice twists and turns, as well as some fun 1930s details. Henry and Ellie are fun characters, and as much as I didn't really want an epilogue set in the present day, I have to admit that I cried when I read it. Weaknesses: The cover on this is great, but ... a telepathically talking cat who mentions sardines a bit too often? Perhaps fans of Warriors books will be coerced into taking on a mystery because of Sam, but on a personal level, talking animals are never my favorite. The Tooting family are stranded in 1966. The parents are rather enjoying themselves, since they can see a famous World Cup game and are enjoying the Carnaby Street atmosphere, but before long, things start to go wrong. 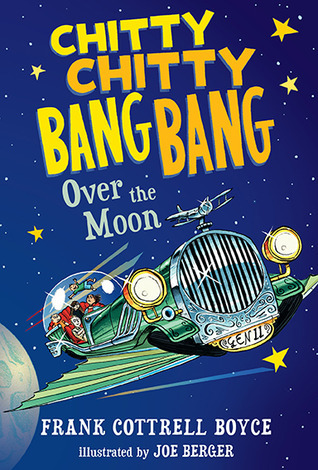 Little Harry disappears, Big Ben shoots off in to space, and the family discovers Jeremy and Jemimah Potts and the original version of Chitty. The Potts parents are presumed with Harry, and the mastermind behind the whole thing seems to be the evil Little Jack. The Tootings try very hard to get everyone back to the place and time where they belong without ruining the space-time continuum, and Mrs. Tooting especially wants to travel back far enough to prevent Little Jack from becoming the monomaniac he is. Fun details abound, from a trip to the moon to a miniaturizer that has shrunk some of the world's great landmarks! Strengths: Very British, and lots of fun details about different parts of history. The different versions of Chitty are fun, too, and the Tooting family having adventures together is pleasant.